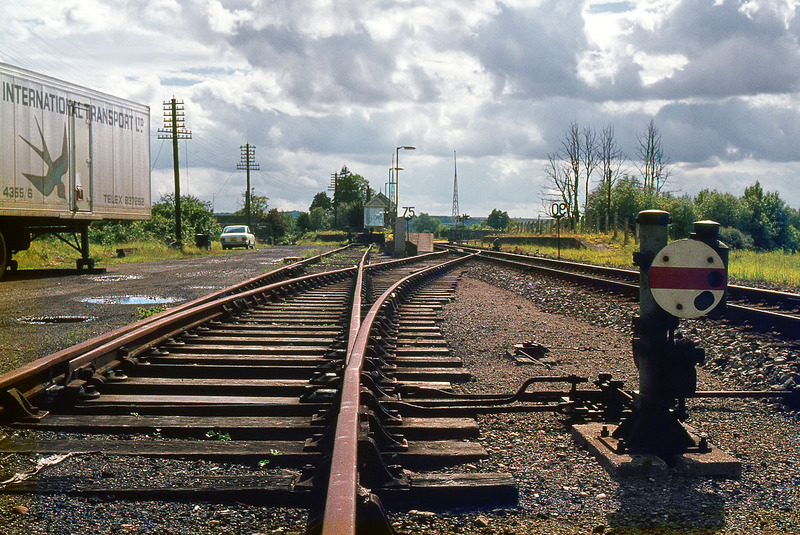 Ascott-under-Wychwood station, pictured during a brief burst of sunshine on 6 July 1978. This historic view shows the track in the now lifted small goods yard, complete with ground signal. Some of the rail chairs were dated 1906. Also visible in the background is the marooned up platform, which became useless after the singling of the line in 1971. This was subsequently removed, and in recent years, with the reinstatement of the double track, a modern replacement has been provided. This slide is from my very first 35mm colour transparency film. Unfortunately this was a roll of Perutz C18, a film with quite unbelievably coarse grain (considering it was only ISO 50). Also, unlike the Kodachrome 64 which I used thereafter, time has not been kind to the images. Whilst the Kodachromes are as good as the day they arrived back from Hemel Hempstead, the Perutz has colour shifted markedly (corrected here).